Sometimes you need to generate not only screenshots of the right-then screen-visible part of a web page, but of a whole page, meaning including the parts of it that you'd only see after scrolling. The aim of this thread here is to work out a short how-to that explains how to solve this task using the Pale Moon browser. Currently Pale Moon doesn't seem to offer any obvious GUI function for this. Activating the "screenshots" function in the developers' section via GUI hasn't worked here either. Press Shift+F2, and you'll see some sort of browser command line opening at the bottom of your browser window. That's it. You'll get a PNG file. Unfortunately Pale Moon doesn't seem to write those pieces of information into the PNG's EXIF data either. There might be more options for the "screenshot" command. Unfortunately I couldn't find any documentation about that. In case anyone knows where to find documentation of the "screenshot" command, please post the link here if you wish. which is valid for palemonn too. As for "filename", Brinkmann says that you should add a filetype extension. However, if you don't, Pale Moon adds ".png" anyway. "clipboard": By default, Pale Moon seems to save your screenshot to a file. If you use the "clipboard" option, you should have it in the clipboard instead. "chrome": By default, you'll get the web page's content window only. If you use the "chrome" option, you should get the "user interface chrome" (i.e. "the borders and widgets that frame the content part of a window", cf. https://en.wikipedia.org/wiki/Chrome#Computing), too. As for "delay", you should only have to fill in a number, and that'll be the number of seconds Pale Moon waits before generating the screenshot. If you fill in nothing: no delay. As for "fullpage", this is the option you should need if you want the whole web page, not only the currently visible part. 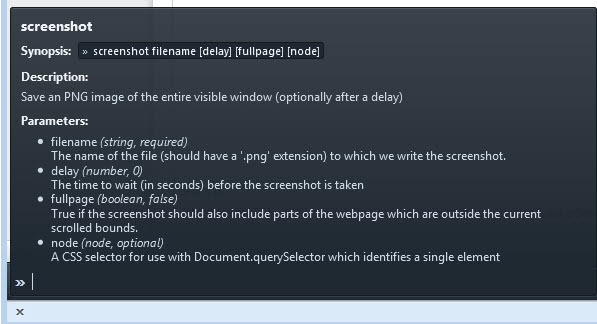 should, after 10 seconds, save your whole web, including the browser window itself, as "myscreenshot.png". However, this doesn't work in Pale Moon here – Pale Moon claims that this is too many options. So I can confirm the restriction you mentioned. I guess that the command's syntax has changed since Brinkmann wrote his article (meaning that the current Pale Moon has been derived from a later Firefox than the one that Brinkmann tested). Any idea where we could get Pale Moon's current syntax from? And the options (commands) are displayed. Doesn't work in Pale Moon. If you want the browser --chrome to show around your screenshot, though, you can’t capture the --fullpage. Firefox will just ignore the -fullpage option if you invoke --chrome, and give you the visible portion of the page surrounded by your browser chrome, including all your addon icons and unread tabs. It appears these options (commands) have changed over time. is no longer displayed as an option in the latest Firefox. I just went to a system with Pale Moon version 27.9.4 installed, and I could reproduce that "screenshot --" doesn't work. This non-display of available options obviously is a bug: Pale Moon does give you a heading ("Verfügbare Optionen") for the supposedly following list of available options, but there isn't any list being displayed. Apart from that, no longer being able to combine "--chrome" and "--fullpage" clearly is a regression that (hopefully) Pale Moon's developer will fix. Until then, I see no way of completing this how-to here, as the functionality in question isn't fully available. b) is a purely code-based regression, correct? Meaning: not something that would have anything to do with the way Pale Moon has been compiled for MX-17.1, nor with some interference with MX-17.1's Xfce desktop environment? I use Pale Moon in Windows. I get: "Available Options" without a list. Based on my testing the 2015 article aligns with what works and what doesn't in Pale Moon. "take the screenshot of the Pale Moon window"
"the screenshot ...of the webpage which are outside.." of the Pale Moon window. The name of the ﬁle (should have a '.png' extension) to which we write the screenshot. True if you want to copy the screenshot instead of saving it to a ﬁle. I don't see it as a regression, either. When I re-read Brinkmann's article, I don't see a reference they can be used together, or he used them together and the results. If they did work together, and I don't believe they ever did, they didn't work in 2015 (per Meyer's article). Which makes some sense, I admit, but part of me wishes someone had gone to the effort of adding code to redraw the chrome all the way around a --fullpage capture if you asked for it. Note he isn't saying bring back this great feature. Great hint, thanks. How did you find out about that? Greetings, and have a nice weekend, Joe.